THOUSAND OAKS, Calif., Nov. 23, 2015 /PRNewswire/ -- Amgen (NASDAQ:AMGN) today announced that the European Commission (EC) has granted conditional marketing authorization for BLINCYTO® (blinatumomab) for the treatment of adults with Philadelphia chromosome-negative (Ph-) relapsed or refractory B-precursor acute lymphoblastic leukemia (ALL). "We are pleased the European Commission granted conditional marketing authorization for BLINCYTO," said Sean E. Harper, M.D., executive vice president of Research and Development at Amgen. "BLINCYTO has demonstrated efficacy in treating relapsed or refractory ALL, a very difficult-to-treat disease for which historically patients had limited therapeutic options. This approval represents an important milestone in immunotherapy research. BLINCYTO is the first clinical validation of the BiTE® platform, a new and innovative approach that helps the body's own immune system fight cancer." The conditional marketing authorization for BLINCYTO is based on results of two Phase 2 studies, study '211 and '206. In the pivotal '211 trial, 42.9 percent of patients achieved complete remission (CR) or CR with partial hematological recovery (CRh*) with single-agent BLINCYTO. The most serious adverse reactions that occurred during BLINCYTO treatment in the pivotal '211 trial included infections, neurologic events, neutropenia/febrile neutropenia, cytokine release syndrome and tumor lysis syndrome. "We tested BLINCYTO in ALL, the most aggressive B-cell malignancy we know, and observed a clinically meaningful remission rate," said Max S. Topp, M.D., professor, Hospital of Wuerzburg, Germany. "This is the first major advance in more than two decades for patients with this hard-to-treat cancer." "The prognosis for adult patients with ALL who are refractory to treatment or experience relapse is poor, and BLINCYTO constitutes a new treatment option for these patients," said Herve Dombret, M.D., professor, University Paris, Hospital Saint Louis, Paris. "It is important for clinicians and patients to have more treatment options in this acute form of leukemia." Approval from the EC grants a centralized conditional marketing authorization with unified labeling in the 28 countries that are members of the EU. Norway, Iceland and Liechtenstein, as members of the European Economic Area (EEA), will take corresponding decisions on the basis of the decision of the EC. Conditional license requires the license to be renewed every year and it will be converted to full standard license once post-licensing commitments have been fulfilled. BLINCYTO was granted orphan drug designation by the European Medicines Agency in 2009 for the treatment of ALL. Study '211 evaluated BLINCYTO in an open-label, multicenter, single-arm Phase 2 study. Eligible patients were at least 18 years of age with Ph- relapsed or refractory B-precursor ALL relapsed with first remission duration of less than or equal to 12 months in first salvage, or relapsed or refractory after first salvage therapy, or relapsed within 12 months of allogeneic hematopoietic stem cell transplantation (HSCT), and had at least10 percent blasts in bone marrow. The primary endpoint was the CR/CRh* rate within two cycles of BLINCYTO. Of the 189 patients evaluated in the trial, 42.9 percent (81/189; 95 percent CI, 35.7 - 50.2) achieved CR or CRh* within two cycles of treatment with BLINCYTO with the majority of responses (79 percent [64/81]) occurring within the first cycle of treatment. In a prespecified exploratory analysis, 82.2 percent (60/73) of minimal residual disease (MRD) evaluable patients with CR/CRh* also had an MRD response. The most common adverse reactions (greater than 20 percent) were infusion-related reactions (67.2 percent), infections (63 percent), pyrexia (59.8 percent), headache (34.4 percent), febrile neutropenia (28 percent), peripheral edema (25.9 percent), nausea (24.3 percent), hypokalemia (23.8 percent), constipation (20.6 percent) and anemia (20.1 percent). The most serious adverse reactions that occurred during BLINCYTO treatment included: infections (31.7 percent), neurologic events (16.4 percent), neutropenia/febrile neutropenia (15.3 percent), cytokine release syndrome (0.5 percent) and tumor lysis syndrome (0.5 percent). Study '206 evaluated the safety and efficacy of BLINCYTO in an open-label, multicenter, dose-escalation Phase 2 study of 36 patients, who were at least 18 years of age with B-precursor ALL relapsed after at least induction and consolidation or having refractory disease with greater than 5 percent blasts in bone marrow, had an Eastern Cooperative Oncology Group (ECOG) performance status of at most 2, had a life expectancy of at least 12 weeks, and who did not have autologous HSCT within six weeks prior to start of treatment, allogeneic HSCT within three months prior to start of treatment, or previous treatment with BLINCYTO. The CR/CRh* rate was 69.4 percent (25/36) with 15 patients achieving CR (41.7 percent; 95 percent CI, 25.5 percent - 59.2 percent), and 10 patients achieving CRh* (27.8 percent; 95 percent CI, 14.2 percent - 45.2 percent). Of the patients with hematologic CR, 88 percent (22/25) also had MRD responses. Overall safety results from this study were consistent with the known BLINCYTO safety profile. BLINCYTO is a bispecific CD19-directed CD3 T cell engager (BiTE®) antibody construct that binds specifically to CD19 expressed on the surface of cells of B-lineage origin and CD3 expressed on the surface of T cells. BLINCYTO was granted breakthrough therapy and priority review designations by the U.S. Food and Drug Administration, and is now approved in the U.S. for the treatment of Ph- relapsed or refractory B-cell precursor ALL. This indication is approved under accelerated approval. Continued approval for this indication may be contingent upon verification of clinical benefit in subsequent trials. BiTE® antibody constructs are a type of immunotherapy being investigated for fighting cancer by helping the body's immune system to detect and target malignant cells. The modified antibodies are designed to engage two different targets simultaneously, thereby juxtaposing T cells (a type of white blood cell capable of killing other cells perceived as threats) to cancer cells. BiTE® antibody constructs help place the T cells within reach of the targeted cell, with the intent of allowing T cells to inject toxins and trigger the cancer cell to die (apoptosis). BiTE® antibody constructs are currently being investigated for their potential to treat a wide variety of cancers. This product is subject to additional monitoring in the EU and EEA. All suspected adverse reactions should be reported in accordance with the national reporting system. The adverse reactions described in this section were identified in the pivotal clinical study (N=189).The most serious adverse reactions that may occur during blinatumomab treatment include: infections (31.7%), neurologic events (16.4%), neutropenia/febrile neutropenia (15.3%) cytokine release syndrome (0.5%), and tumor lysis syndrome (0.5%). The most common adverse reactions were: infusion-related reactions (67.2%), infections (63.0%), pyrexia (59.8%), headache (34.4%), febrile neutropenia (28%), peripheral edema (25.9%), nausea (24.3%), hypokalaemia (23.8%), constipation (20.6%), anaemia (20.1%), cough (18.5%), diarrhea (18.0%), tremor (17.5%), neutropenia (17.5%), abdominal pain (16.9%), insomnia (15.3%), fatigue (15.3%), and chills (15.3%). This safety information is specific to the current U.S. approved indication. 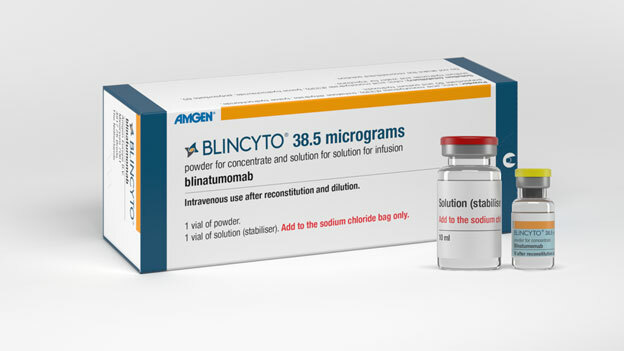 BLINCYTO® is indicated for the treatment of Philadelphia chromosome-negative relapsed or refractory B-cell precursor acute lymphoblastic leukemia (ALL). This indication is approved under accelerated approval. Continued approval for this indication may be contingent upon verification of clinical benefit in subsequent trials. Cytokine Release Syndrome (CRS): Life-threatening or fatal CRS occurred in patients receiving BLINCYTO®. Infusion reactions have occurred and may be clinically indistinguishable from manifestations of CRS. Closely monitor patients for signs and symptoms of serious events such as pyrexia, headache, nausea, asthenia, hypotension, increased alanine aminotransferase (ALT), increased aspartate aminotransferase (AST), increased total bilirubin (TBILI), disseminated intravascular coagulation (DIC), capillary leak syndrome (CLS), and hemophagocytic lymphohistiocytosis/macrophage activation syndrome (HLH/MAS). Interrupt or discontinue BLINCYTO® as outlined in the Prescribing Information (PI). Neurological Toxicities: Approximately 50% of patients receiving BLINCYTO® in clinical trials experienced neurological toxicities. Severe, life-threatening, or fatal neurological toxicities occurred in approximately 15% of patients, including encephalopathy, convulsions, speech disorders, disturbances in consciousness, confusion and disorientation, and coordination and balance disorders. The median time to onset of any neurological toxicity was 7 days. Monitor patients for signs or symptoms and interrupt or discontinue BLINCYTO® as outlined in the PI. Tumor Lysis Syndrome (TLS): Life-threatening or fatal TLS has been observed. Preventive measures, including pretreatment nontoxic cytoreduction and on treatment hydration, should be used during BLINCYTO® treatment. Monitor patients for signs and symptoms of TLS and interrupt or discontinue BLINCYTO® as needed to manage these events. Elevated Liver Enzymes: Transient elevations in liver enzymes have been associated with BLINCYTO® treatment. The majority of these events were observed in the setting of CRS. The median time to onset was 15 days. Grade 3 or greater elevations in liver enzymes occurred in 6% of patients outside the setting of CRS and resulted in treatment discontinuation in less than 1% of patients. Monitor ALT, AST, gamma-glutamyl transferase (GGT), and TBILI prior to the start of and during BLINCYTO® treatment. BLINCYTO® treatment should be interrupted if transaminases rise to > 5 times the upper limit of normal (ULN) or if TBILI rises to > 3 times ULN. Leukoencephalopathy: Although the clinical significance is unknown, cranial magnetic resonance imaging (MRI) changes showing leukoencephalopathy have been observed in patients receiving BLINCYTO®, especially in patients previously treated with cranial irradiation and anti-leukemic chemotherapy. The most commonly reported adverse reactions (≥ 20%) in clinical trials were pyrexia (62%), headache (36%), peripheral edema (25%), febrile neutropenia (25%), nausea (25%), hypokalemia (23%), rash (21%), tremor (20%), diarrhea (20%), and constipation (20%). Serious adverse reactions were reported in 65% of patients. The most common serious adverse reactions (≥ 2%) included febrile neutropenia, pyrexia, pneumonia, sepsis, neutropenia, device-related infection, tremor, encephalopathy, infection, overdose, confusion, Staphylococcal bacteremia, and headache. Please see full U.S. Prescribing Information and medication guide for BLINCYTO at www.BLINCYTO.com. This news release contains forward-looking statements that are based on the current expectations and beliefs of Amgen Inc. and its subsidiaries (Amgen or us) and are subject to a number of risks, uncertainties and assumptions that could cause actual results to differ materially from those described. All statements, other than statements of historical fact, are statements that could be deemed forward-looking statements, including estimates of revenues, operating margins, capital expenditures, cash, other financial metrics, expected legal, arbitration, political, regulatory or clinical results or practices, customer and prescriber patterns or practices, reimbursement activities and outcomes and other such estimates and results. Forward-looking statements involve significant risks and uncertainties, including those discussed below and more fully described in the Securities and Exchange Commission (SEC) reports filed by Amgen Inc., including Amgen Inc.'s most recent annual report on Form 10-K and any subsequent periodic reports on Form 10-Q and Form 8-K. Please refer to Amgen Inc.'s most recent Forms 10-K, 10-Q and 8-K for additional information on the uncertainties and risk factors related to our business. Unless otherwise noted, Amgen is providing this information as of Nov. 23, 2015, and expressly disclaims any duty to update information contained in this news release. In addition, sales of our products (including products of our wholly-owned subsidiaries) are affected by the reimbursement policies imposed by third-party payers, including governments, private insurance plans and managed care providers and may be affected by regulatory, clinical and guideline developments and domestic and international trends toward managed care and healthcare cost containment as well as U.S. legislation affecting pharmaceutical pricing and reimbursement. Government and others' regulations and reimbursement policies may affect the development, usage and pricing of our products. In addition, we compete with other companies with respect to some of our marketed products as well as for the discovery and development of new products. We believe that some of our newer products, product candidates or new indications for existing products, may face competition when and as they are approved and marketed. Our products may compete against products that have lower prices, established reimbursement, superior performance, are easier to administer, or that are otherwise competitive with our products. In addition, while Amgen and its partners routinely obtain patents for their products and technology, the protection of our products offered by patents and patent applications may be challenged, invalidated or circumvented by our or our partners' competitors and there can be no guarantee of our or our partners' ability to obtain or maintain patent protection for our products or product candidates. We cannot guarantee that we will be able to produce commercially successful products or maintain the commercial success of our existing products. Our stock price may be affected by actual or perceived market opportunity, competitive position, and success or failure of our products or product candidates. Further, the discovery of significant problems with a product similar to one of our products that implicate an entire class of products could have a material adverse effect on sales of the affected products and on our business and results of operations. Our efforts to integrate the operations of companies we have acquired may not be successful. We may experience difficulties, delays or unexpected costs and not achieve anticipated benefits and savings from our ongoing restructuring plan. Our business performance could affect or limit the ability of our Board of Directors to declare a dividend or their ability to pay a dividend or repurchase our common stock. 1. Cancer Research UK. Acute lymphoblastic leukaemia risks and causes. _http://www.cancerresearchuk.org/about-cancer/type/all/about/acute-lymphoblastic-leukaemia-risks-and-causes. Accessed November 16, 2015. 2. Mayo Clinic. "Acute lymphocytic leukemia." Available at: _http://www.mayoclinic.com/health/acute-lymphocytic-leukemia/DS00558. Accessed on November 16, 2015. 3. Advani A.S. New immune strategies for the treatment of acute lymphoblastic leukemia: Antibodies and chimeric antigen receptors. Hematology Am Soc Hematol Educ Program. 2013;2013:131-7. Retrieved from: http://asheducationbook.hematologylibrary.org/content/2013/1/131.long. 4. Amgen data on file. 5. Katz AJ, Chia VM, Schoonen M, Kelsh MA. Acute lymphoblastic leukemia: an assessment of international incidence, survival, and disease burden. Cancer Causes Control. 2015;26(11):1627-1642. 6. United Nations, Department of Economic and Social Affairs, Population Division (2013) World Population Prospects: The 2012 Revision. http://esa.un.org/wpp/unpp/panel_indicators.htm. Accessed November 16, 2014.